Equivocation, the play, explores equivocation in all its facets and its application in personal relationships as well as government policy (and, on another level, the role of theater as equivocation in the fictionalizing twist of facts for the sake of art, entertainment, or an agenda). Macbeth played not only to King James but to a public that generally scoffed at the priests’ doctrine of equivocation. Yet, Cain points out in his play that it was the government itself that adopted the doctrine of equivocation. Shakespeare and power politics in Commentary. 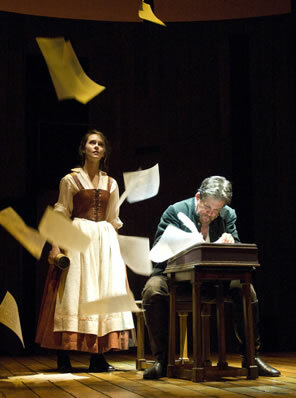 Kreeger at Arena Stage, Washington, D.C.
Christine Albright as Judith and Anthony Heald as Shag in Equivocation. Photo by Jenny Graham, Oregon Shakespeare Festival/Arena Stage. It’s fun to make up a fictional biography about a historical person. You can create your own facts to fit in with the real facts and achievements of a person the audience knows so well and score many knowing nods and "ahhh, yes" reactions. Heck, Shakespeare did that himself. Now comes Equivocation, a play by Bill Cain about Shakespeare and the Gunpowder Plot. It is to Macbeth what Shakespeare in Love was to Romeo and Juliet, a fictional account of the circumstances leading to the writing of the play (including first drafts under a totally different title). And, like Shakespeare in Love, Equivocation is a witty, fun script that delves into philosophical profundity tuned specifically to our current times. Aside from the script, though, the standout of this Oregon Shakespeare Festival production was the outstanding performances of the six actors who comprise the cast, four of them mastering multiple roles. Those four appeared in the play’s second scene as King Lear (Richard Elmore), Mad Tom (John Tufts), The Fool (Gregory Linington), and Kent (Jonathan Haugen) raging on the stormswept heath. It was great Shakespeare until the whole scene devolved into the cacophony of all four shouting their lines at the same time, then suddenly stopping. After a beat of confusion, the guy playing Lear said, “This is where we always go off track.” Ah, this was, respectively, Richard Burbage, Richard Sharpe, Robert Armin, and a fourth King’s Men shareholder, Nate, rehearsing the scene. At that point, we knew we were in for a wonderful flight of pseudo-factual fantasy. Cain’s imagination allowed us to watch Shakespeare (called Shag in the play and played by Anthony Heald) interact with his fellows, family, and royal patrons. We saw played out his relationship with Burbage (how strong was their friendship? ), King James (why was Shakespeare so favored in the court? ), his wife (she’s not in the play, so there’s a clue), his long-dead son, and, most important, his daughter, Judith. Christine Albright, the troupe’s lone female, though playing only the one role, was the most complex character in the play, and Albright brought it off with great sympathy and respect. We so wanted her dad to love her, and we were moved when we learned how much he did. Naturally, a play centered on the biographical Shakespeare can’t pass without jokes at our Bard’s expense, and Equivocation has quite a few. Shakespeare’s stature as the writer of his time is unquestioned, but his skills as an actor are a constant source of needling him. Judith keeps a tally of the characters killed in her father’s plays (“You can’t count the war dead,” he tells her. “I’m not responsible for the war dead”). She also denigrates his use of soliloquies, which she does in a soliloquy, a fourth wall witticism which becomes a running joke in the play but comes to a poignant conclusion. Richard can’t understand why a king (Lear) is wearing nothing but a diaper, and Shag can’t adequately explain his purpose for the portrayal. Heald’s Shag was an everyday Will who saw himself as an artist and saw value in his past work but worried that his creativity was slipping (ah, so he’s a typical writer after all!). Heald showed us in expression, posture, and walk the man’s ego rippling underneath an insecure and mostly humble exterior. He was also, above all else, a pragmatist, but he did desire posterity and hoped that his plays would continue being staged for another 50 years. While his relationship with Judith is the play’s emotional center, it is his interactions with Secretary of State Robert Cecil (Haugen) that is the plot’s centerpiece. Cecil demands that Shag write a play about the Gunpowder Plot, and the two meet often as Shakespeare tries to come to grips with staging a story that doesn't have a big finish (i.e., Parliament did not get blown up) and a plot—both the play's and the originating case against the conspirators—with too many holes. Equivocation opens with their formal first meeting, and despite being in the presence of the government’s most dangerously powerful man, Heald’s Shag was very much at ease. Subsequent scenes between them each had different tones—threatening, affectionate, casual, gulling—that taken together create one of the most complex characters I’ve ever seen on stage: not Shag, but Cecil, a Verbal Kint-like character who actually plays out Equivocation's titular theme. Unable to get his hands around both the truth of the Powder Plot and the enigma that is Cecil, and all the while encountering the raw power of political ambition, Shag channels these experiences into writing Macbeth and presents it to King James. Equivocation, the play, explores equivocation in all its facets and its application in personal relationships as well as government policy (and, on another level, the role of theater as equivocation in the fictionalizing twist of facts for the sake of art, entertainment, or an agenda). Macbeth played not only to King James but to a public that generally scoffed at the priests’ doctrine of equivocation (“here’s an equivocator that could swear in both the scales against either scale,” says the Porter). Yet, Cain points out in his play that it was the government itself that adopted the doctrine of equivocation. Aside from the suspect nature of the Gunpowder Plot (was it actually a government conspiracy to consolidate James’ influence? ), the conspirators were tortured for information. However, as both James and Cecil acknolwedge in the play that torture is illegal in Britain, they assert that their interrogation techniques therefore were not really torture. Cain’s inspiration for writing the play was a visit to a London Tower exhibit of torture devices and a sign there that said, “No prisoner was ever tortured in the Tower of London because of religion.” That is true if you consider the persecution of, first, Catholics, then Protestants, then Catholics again a political rather than religious matter—equivocation, that. John Tufts as King James. 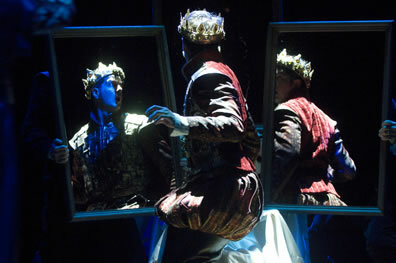 Some scholars believe Shakespeare may have staged the apparition scene in such a way that James could see himself in the final vision's mirror. Equivocation shows how that trick might have been done. Photo by Jenny Graham, Oregon Shakespeare Festival/Arena Stage. Yes, this is a play about Shakespeare’s age with modern political applications. As such, the characters have modern sensibilities. And with that come many ironic assertions and remarkable prescience, especially on the part of Cecil. When Shag appeals to his conscience and the souls of his children, Cecil points out that his descendants will go on to lead the nation brilliantly and even win a Nobel Peace Price. Such lines are, alone, a reason for Shakespeare fans to read or see Cain’s play. On top of that, you have the performances of this Oregon Shakespeare Festival production (first mounted in Oregon in 2009). The whole cast was strong individually and tight as an ensemble, but a couple of performances stood out. Haugen’s Nate was a rather subdued performance, but Haugen’s Robert Cecil was powerful acting in voice and, using no prosthetics or props, in portraying his spine curvature and gait disability—a mesmerizing physical performance equal to the great Richard IIIs (Antony Sher, Ian McKellen) we’ve seen on stage. John Tufts was a hot-headed Sharpe, but his King James seemed a soppish dolt. Sharpe had to literally jump back and forth between James (speaking authentic Scots brogue) and Sharpe playing Macduff (with a fake Scottish brogue) in the climactic scene. His James delighted excitedly watching the witches and then being featured in the mirror trick of the apparition scene like a kid unleashed on Christmas morning. Then, afterward, he delivered with scary astuteness Equivocation's most politically piercing line. To tell that line would spoil the play's most profound gotcha. Even having the doctrine of equivocation at my beck won't move me to violate that trust.